Please note that we deliberately held back the publication of our November 30 edition because there was too much good news in the first week of December to make everyone wait another month to hear about it! The LiveWorkPlay Family Conference 2009 was held on November 21. This year the topic was "A Question Of Safety" and for the first time in the 5 year history of this event registration was open to the general public. There was a huge turnout as you can see from this photo album and this short video. The team of presenters was comprised of Constable Tom McKay (Peel Regional Police), Gabriela Mattison (Brampton Caledon Community Living Staff), and Sean Travis (Brampton Caledon Community Living Board of Directors). Sean (pictured at podium) is a self-advocate and a graduate of the Crime Prevention Academy offered by the Peel Regional Police. About 125 registrants that included people with intellectual disabilities, family members, and professionals in various fields dedicated their Saturday morning and afternoon to learning and thinking about the sometimes conflicting desires of independence and safety. Special thanks to The Law Foundation of Ontario for their financial support! LiveWorkPlay is working on having multiple events of this nature throughout the year. Plans are not set, but a session about the Registered Disability Savings Plan as well as Wills and Trusts is tentatively scheduled for the end of February. Keep an eye on the calendar for updates, or better still, join our Fan Page on Facebook or Follow Us on Twitter. Gillian Gillespie is a LiveWorkPlay member but she is better known to the world as an author of children's books! She has recently published her secon d book in the series known as Wacky Witch And Wizard World: The Adventures Of Grace And Archimedes. On November 25th Gillian appeared as a guest on the Rogers 22 Television Daytime show where she discussed her book with hosts TL Rader and Derick Fage and did a great job talking about LiveWorkPlay too. Although she invited LiveWorkPlay co-founder Keenan Wellar to join her on the program, you will see from the video of her interview that she did not need any help! Heartwood House is a federation of 15 non-profit organizations working better together under one roof at 153 Chapel Street in Ottawa. Heartwood House is also home to a remarkable partnership initiative whereby people supported by LiveWorkPlay and other member organizations benefit from a unique arrangement with the City of Ottawa for the management of the OC Transpo Lost & Found. Heartwood House was one of 41 nominees for one of thirteen Celebration of People awards given out on December 3rd. This annual event commemorates the United Nations Day of Persons with Disabilities. The event has strong support from a variety of private, public, and charitable sector partners and attracted an audience of over 400 people. There were 3 finalists in the category of The Volunteer Opportunities Award. 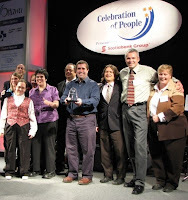 Sponsored by Volunteer Ottawa, this award recognizes an organization that has shown leadership in creating opportunities for persons with disabilities to engage in meaningful volunteer opportunities. All of the nominees and finalists were deserving of recognition, but it is with great delight that we announce Heartwood House as the 2009 recipient! You can watch a short video from the ceremony or check out a photo album. The LiveWorkPlay connection extends beyond the many individuals who have benefited from the employment training program. Two of the original ten Heartwood House founders are LiveWorkPlay co-founders Julie Kingstone and Keenan Wellar. The current Heartwood House board of directors is chaired by Keenan alongside four other volunteers including LiveWorkPlay staff members Allison Moores and Fran Childs, who joined the Heartwood board prior to accepting their current positions with LiveWorkPlay. Maureen Moloughney, Executive Director of Heartwood, is also a founder and has been the leader of the Lost & Found initiative, working closely with Patrick Curran from OC Transpo, who has championed this innovative enterprise from its inception in 2001. Thanks to two separate invitations from the Canadian Association for Community Living (CACL) LiveWorkPlay members Cooper Gage and Caroline Matte had the opportunity to take part in events at the Parliament of Canada. Cooper Gage was honoured to attend the release of the Annual Report Card on Child and Family Poverty in Parliament West Block. Many of the issues for combating child poverty are closely related to those that impact people with disabilities and their families especially affordable housing - we are the world's only industrialized country without a national affordable housing strategy! This was a point that Cooper stressed with many of those in attendance, and he particularly enjoyed his chat with Justin Trudeau. 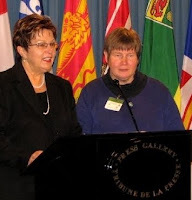 Caroline Matte was invited to participate in the launch of CACL's National Report Card on Inclusion. Caroline made a speech in the Parliamentary Press Gallery of Canada that impressed not only those in attendance, but has received considerable attention on Facebook and YouTube. Her comments were also featured in various CanWest newspapers including the online edition of the Ottawa Citizen and the print edition of the Edmonton Journal. Special thanks to CACL President Bendina Miller (pictured with Caroline above) as well as Anna MacQuarrie, Don Gallant, and Stella Vilas for extending Caroline the invitation and making her feel welcome. When the HeARTwood Gallery graciously offered to host a LiveWorkPlay art show, staff member Allison Moores had to move fast to get it all in place for the opening date. Fortunately two former gallery curators (Kae McColl and Angela Maxwell) accepted her invitation and lent their expertise in mounting the art, and it all came together for a smashing launch party on December 4th. Pictured to the right is artist Michael Hinchcliff. The gallery was really buzzing thanks to some incredible art that ranged from sketches to paintings to photography. It all came together as Celebrating Community: Artistic Expressions. You can get a flavour for this special evening by watching a short video that includes artist interviews and photos of all the artwork. 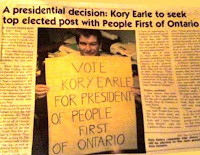 On October 24th Kory Earle of Lanark was elected President of People First of Ontario. Kory is already well known to many in the Ottawa area for his advocacy on behalf of people with intellectual disabilities in successfully opposing the picketing of group homes during a strike in his community. LiveWorkPlay CEO Keenan Wellar recently caught up to the busy Mr. Earle while he was in town for a meeting with government officials. During their breakfast meeting Keenan explained that LiveWorkPlay and other formal and informal groups in the area are very interested in supporting the growth of People First in the Ottawa area. This is a great fit for Mr. Earle's plans. He says he wants to build local chapters in areas where they don't exis t, and strengthen membership in places where People First is already active. If all goes according to plan, People First of Ontario will hold an information meeting in Ottawa sometime between the middle of February and the middle of March. 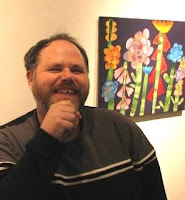 "We work very hard to support self-advocacy for people with intellectual disabilities, but as a provider of supports and services, we cannot support an independent voice in the same way as People First," says Keenan. "It only makes sense that we should promote self-advocacy by facilitating connections between the people we support and an organization like People First. Congratulations also to David McKillop of Gananoque who finished second in the presidential election: "He was a strong candidate," said Earle. McKillop is well known to many in the LiveWorkPlay community thanks to his wonderful singing and guitar playing in support of various events like his performance at Engines of Success 2009. Over the past 6 months (since accepting the position of Coordinator of Volunteers and Support Networks) Fran Childs has been visited by a steady stream of newcomers who have completed intake interviews, background checks, and orientation sessions. By the end of December she expects that the team will have tripled in size from 30 to 90! Not only has the volunteer team expanded, they are more active than ever in contributing to LiveWorkPlay and a better quality of life for people with intellectual disabilities. Thanks to volunteer feedback there have been a series of improvements to strengthen the new one-to-one matching initiative. "There is so much to think about in facilitating the development of these relationships," says Fran. "But we are all learning together and it is obvious that we are having success. I am getting positive feedback every day!" LiveWorkPlay also believes that the expansion of the volunteer team is helping create a stronger community. With each person that takes the time to get to know an individual with an intellectual disability on a personal level, to learn about the LiveWorkPlay organization and its work, and to become familiar with the issues and challenges that result in the exclusion of people with intellectual disabilities, a new "inclusion ambassador" is born! We introduced readers to Carleton University placement student Emily McLean in our September issue, and LiveWorkPlay is confident that no matter what the future holds, she will be a strong inclusion ambassador. As a student in the Bachelor of Social Work program, it's probably fair to say that Emily had no idea what she was getting into when she arrived at LiveWorkPlay. But she learned fast and was soon fitting right in. Emily, you will be missed! The great thing about grassroots fundraisers is they not only raise money for LiveWorkPlay, they tend to be a lot of fun. The one happy problem of late is it is actually getting difficult to keep track of all that has gone on! On November 1st Robert Bigras and his wife Kate Lusk decided that Robert's 50th Birthday Party would be a kitchen party gathering to benefit LiveWorkPlay and l'Arche. "It was a blast," says LiveWorkPlay co-founder Julie Kingstone. "We are hoping to learn from Robert and inject a bit of his energy into our own Family Feast events." Greta Leeming Studio’s Competitive Dance Team traded their dance shoes for bowling shoes on October 25th at Westpark Bowling Centre to help support LiveWorkPlay in memory of a beloved and cherished staff member Phyllis Grey. The finally tally was not announced in time to make last month's issue, so we are thrilled to announce that $2800 was raised. Phyllis's daughter Linda benefits greatly from this [LiveWorkPlay] organization," said organizer Tami-Lynn Caloia. "Special thanks to all who helped by donating prizes, volunteering and to all who participated to support this great cause!" In other fundraising news, Julie More sent in more than $500 raised through a Walk-a-Pet fundraiser. Contributors participated from all across Canada including Waterloo, Ontario and Burnaby, British Columbia! The one thing all of this month's grassroots fundraisers have in common is that the lead organizers are not direct relations of anyone that receives services supports or services from LiveWorkPlay. They are all people that are connected to someone who is connected - and they chose to get involved. This is great news, not only because the donations are greatly appreciated, but because it also means that hundreds of new people are learning about LiveWorkPlay, our work, and the people we support for the first time! Opportunities for professional development are difficult to squeeze into a hectic schedule, but Manager of Employment Supports Jen Bosworth managed to get out to Moncton for a few days and take in the 15th Annual National Supported Employment Conference. These are challenging times for many Ottawa area employers but LiveWorkPlay is having success in supporting adult members to find and keep paid employment and meaningful volunteer opportunities. "There will always be ups and downs," says Jen. "It's not LiveWorkPlay that gives people jobs, it's employers that do that, and those employers have to make difficult choices about who to hire and fire." 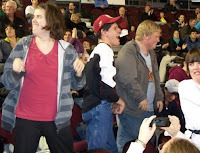 What LiveWorkPlay does to support employment boils down to three main tasks: 1) helping individuals ready themselves to pursue their employment goals; 2) working with employers to build their interest in hiring a person with an intellectual disability; and, 3) facilitating an ongoing healthy relationship between the individual and their employer. One key to success is getting a foot in the door, and Jen would like to hear from any of our readers that are willing to facilitate an introduction with an employer in their personal or professional networks. "Almost all of our successes have come thanks to a connection made by a member of the LiveWorkPlay community," says Jen. November was jam-packed with fun opportunities for LiveWorkPlay members of all ages. Youth members had a blast at the November 20th Ottawa 67s hockey game. It was according to reports one of the most exciting games of the year. After getting down 3-1, Ottawa managed to score 3 goals in about an 8 minute span during the third period to squeak out a 4-3 victory over the Plymouth Whalers, and the crowd went absolutely wild! Adult members have been enjoying not only Friday nights (a traditional night out for those who are looking to LiveWorkPlay for support with their weekend social activities) but also a revival of "Saturday Socials" which are informal gatherings hosted by members with some support from LiveWorkPlay staff. One such gathering in November was a housewarming and pool party for Heather Wynn, who has moved into a condominium apartment. The type of support provided for Saturday Socials is different for each individual. Some only want help in "getting the word out" whereas others ask for assistance with a series of organization tasks. Full-time staff members Anthony Stratton, Grace Hudson, and Daniel Harris as well as part-time staff Jennifer Cunningham have all had a hand in Saturday Socials, and they all report they same thing: as people have learned to get more comfortable with both hosting and being a guest, attendance is up, and so is enjoyment! Don't forget to register now for LiveWorkPlay's final events of the year! First up is the Festive Family Feast on Friday, December 18. It features a prime rib dinner (vegetable parmigiana for the vegetarians) plus music by Maureen Moloughney! Next up is the LiveWorkPlay New Year's Eve Dinner & Dance on Thursday, December 31. The timing this year is great - the day after the party is a holiday and then it is the weekend! Enjoy a gourmet buffet and professional DJ from Quality Entertainment. Click here to purchase tickets for one or both events! We are at the end of United Way Ottawa/Centraide campaign season (but of course donations are appreciated throughout the year) and this is a great time to contribute to LiveWorkPlay and any other charities that you support. You can download a United Way donation form that already has the LiveWorkPlay information included. The United Way supports LiveWorkPlay youth services! We hope you have enjoyed this 36th edition of LiveWorkPlayNews. If you have received an email about this blog in error and/or you would prefer not to receive future LiveWorkPlayNews messages, simply click here and follow the simple instructions. Click here for the web page that can be used by newcomers who would like to join LiveWorkPlayNews. Feel free to share the address with friends, colleagues, and family who might like to subscribe. Send story ideas to Keenan Wellar.